The focus here was KUSHIDA and Despy building heat for their upcoming IWGP junior heavyweight title match, but once again Hirai Kawato stole the show. Let’s talk about Chase Owens. A few short words and one symbolic bump later, with thousands of shocked fans reduced to tears, we were left to speculate on the vagueness of Katsuyori Shibata’s return to the ring for the first time since Sakura Genesis in what was an incredibly emotional scene. Post match, G.O.D. came out to challenge, and Tama Tonga proceeded to cut one of the worst promos you’ll ever hear on a major league show. Killer Elite Squad made their surprise return through the crowd and destroyed everyone, which probably means we’re getting a three way match for the titles. Hiromu was not booked well on this tour, taking far too many falls, usually as EVIL’s partner. Juniors typically eat falls for their heavyweight stablemates, but in the case of Hiromu, this was a guy who was protected to the extreme between the time he re-debuted with the company in late 2016 until he lost the junior title to KUSHIDA (a booking decision I strongly disagreed with), rarely losing and never dropping the fall when he did. 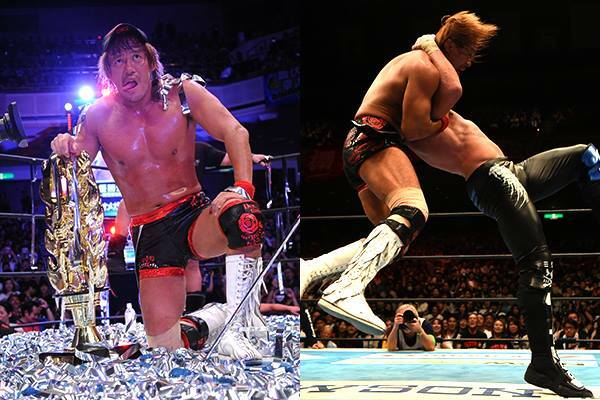 His long singles undefeated streak between his return and the Best of the Super Junior tournament featured a billed match at Wrestle Kingdom (fourth from the top), multiple semi main events, and never losing falls in tags. It felt like Hiromu, and by proxy the junior division as a whole, was being elevated beyond the usual junior level, with Hiromu carrying a special kind of aura and looking like a future top star, whether as a junior or otherwise, and being protected as such. Over the last three weeks, it was disappointing to see him used as pin eating fodder in prelim tags, no longer carrying that special aura, reduced to the same old booking patterns of the rest of the juniors. I had bought into the idea that the juniors, but especially Hiromu, had been elevated to a new level. It appears I was wrong, and I feel like a fool for buying in. The reality is, now he’s just another junior in the crowd, who will be heated up come title shot time, left laying and looking at the lights otherwise. And don’t get me started on Daryl, which while over, is firmly a prelim gimmick. I’m not suggesting they’ve killed Hiromu dead, and perhaps I worked myself into a shoot with their long term plans, but it’s hard enough to be a legitimate main event player as a junior, let alone when saddled with a stuffed animal gimmick that simply won’t play at the top of the card in a company like this one. I’m not saying he can’t recover. But now I have serious doubts that they ever saw him as a top line player to begin with, which is a shame, because I genuinely believe he can be. When it was all said and done, it was the final and the result that we all expected. It all made too much sense. Omega defeats Okada on the final night of the block to even the score at 1-1-1, and Naito beats Omega to get his win back from a year earlier and move on to face, and likely defeat, Okada at Wrestle Kingdom 12, in the money match that the company has been setting up since keeping the two away from each other for well over a year. 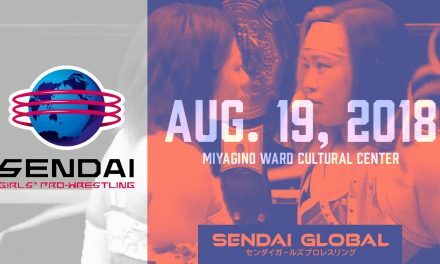 It also sets up Omega to potentially face Kota Ibushi in the Dome, which would be the strongest possible combination of top two matches from a drawing perspective that the company could conceivably put together. If the vague nature of Shibata’s surprise appearance leads to an in ring return, a Wrestle Kingdom match against Tanahashi would be a triple main event for the ages. The match itself was an incredible display of beautiful excess. Omega is the hottest wrestler in the world. Naito is peaking right now in Japan, putting to rest the short sighted argument that they waited to long to pull the trigger on him. 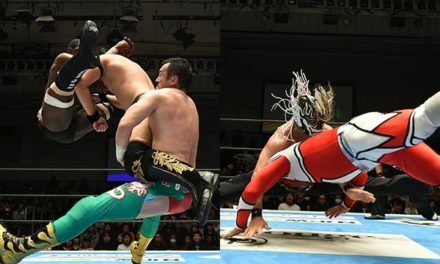 Both men have a story to finish with Okada. They walked right up to the line of too much without ever quite crossing it, with enough story sprinkled in (Omega’s Destino vulnerable neck, set up by a piledriver that was supposed to go through a table but ended up just barely making contact and nearly ending in disaster) to keep things somewhat honest. But they clearly weren’t going for classic psychology beyond. This was meant to be thrilling, dramatic, and utterly insane, and that’s what they delivered. There is some nitpicking to be had, with the near botch on the table spot, Naito’s sloppy looking Destino’s (that Omega did his best to save by taking wild bumps to cover for the messy execution), and the V-Trigger being such a killer strike that it works against Omega sometimes because it’s hard to understand how it doesn’t finish people off instantly let alone after the second, third, fourth, fifth time, but focusing on those minor gripes feels like hitting the lottery for $100 million and complaining about the taxes. A fun, newsworthy show capped off by an all time great G1 Climax final. New Japan is the greatest pro wrestling on the planet, and the run figures to continue for a long time, as they’re set up tremendously for the future. We’re all very lucky to be part of it. This is a special time. Enjoy it.